I grow my groceries in my front yard. I've been growing gardens in front yards since I was eight years old. It started that way simply because that's where the best sunlight was, right out front. Let me ask, if you're honest, where's your best sunlight? For, I'd say, 90% of Americans with yards, their best sunlight is in the front yard. Anyway, as I was going to say: if you're afraid to grow in your front yard where you've got good sun, and you instead choose a protected (albeit shady) spot, you won't grow much at all, so you won't have to worry about people stealing anything. Voila, perfect. Theft averted! But, I was in the middle of a story. Let me back up. 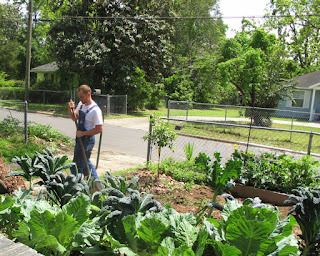 Because I grew a vegetable garden in the front yard as a child, I became known as "that kid who gardens on the corner." I never had anything stolen out of my garden as a kid. But it was in a "quiet" suburban neighborhood. And there was no sidewalk. But then my elderly neighbor who had been campaigning for a sidewalk on our block for a decade finally got her wish. So then people walked right by my vegetable garden. And, as it happened, our street actually was a short-cut between the "projects" and a shopping mall. So guess what happened after the sidewalk was built? ...I got to know more of my neighbors, plus some folks who walked through. 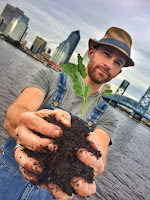 And, I learned that food gardens are one of the best icebreakers for meeting people, learning recipes, and hearing stories about other people's families. And, still, no one ever stole anything. Well, there was that one time around Thanksgiving, during the 2008/9 financial collapse when -- I can't remember, did I tell somebody they could pick some greens?-- someone harvested three collard plants down to the nubs, seemingly in the middle of the night. So, I lost like $3 of collard greens. Maybe. Meanwhile I had another 50 plants laden with greens that went untouched. But, after all, that was in a suburban neighborhood. In 2011, my wife and I moved near downtown into a duplex, our first home. 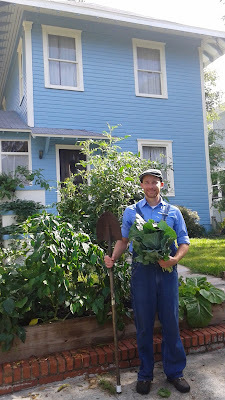 Our landlord allowed us to build and grow a garden, and the best sunlight was, again, in the front yard. So, there we grew. There was heavy foot traffic on a sidewalk across the street, and a long, long red light stopped people immediately in front of our food garden for minutes on end. My wife and I weighed and recorded everything we harvested for the sake of research. 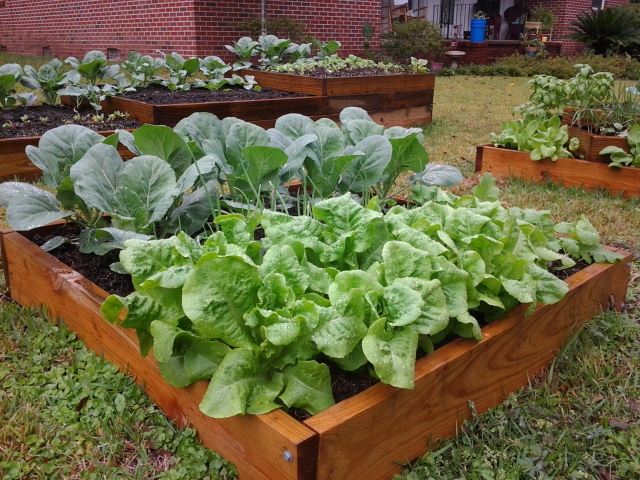 Out of our 80-square-foot raised bed food garden, we harvested 390lbs of veggies and herbs in 9 months. (Here's a little press release my friend wrote up about that garden.) We think, but aren't sure, that someone took a single head of lettuce. Next, in order to be close by TFN's iGrow Whatever You Like youth farm, we moved to "D-Block," a section of a neighborhood that was the "hood" by most definitions: boys walked the street who were probably selling; ladies walked the streets who were, also, probably selling (something different); one of our neighbors regularly ran down the street playing imaginary football with himself. Nevertheless, by this time, we realized that not only did front-yard food gardens afford the best sunlight and, therefore, productivity, and give us a great way to meet our neighbors; front-yard gardens also permitted us to see and tend our food garden in small easy ways almost daily, so weeds couldn't sneak in, nor could produce go bad before we noticed it ripening. (This deserves it's own post, so stay tuned). So, once again we planted in the front yard, right by the street (both inside & outside the chain-linked fence). I remember one day when I was out pulling carrots and cutting lettuce for dinner, bent over, back to the street. These two big guys came walking up on me; I just caught them out the corner of my eye; they'd kind of snuck up on me. I had that sinking feeling like "Oh s***" as I slowly stood up and pivoted to face them. And you know what happened? This guy, the bigger one, he smiles, the glasses on his face rise on his cheeks and he said, "Evening, how you doing? It's a cool thing you're doing with the garden. I like it." I don't believe we had a single snap pea taken from our garden in the hood. So, as you might imagine, when we moved to Jacksonville, FL because, as is usually the case, our best sunlight was in the front yard, and since we wanted our groceries growing "in-sight and in-mind," and because we wanted to get to know our neighbors, we, once again, decided to grow our groceries in the front yard. This past week, someone took a bush full of habeñero peppers, a definite disappointment because our buddy, Chad, had planned to make hot sauce. But, to keep things in perspective, the loss of the habeñeros brings our total lifetime losses up to about a full $10. In 25-ish years of growing our groceries in front yards we have harvested, conservatively, $10,000 of produce. My household has eaten its fill, and we've given hundreds of pounds away to friends, family, neighbors, passersby, and food pantries. Easily $10,000, maybe more. Any loss pales in comparison to the bounty of our front-yard food gardens. For your own sake as well as for the sake of that gang of vegetable-eating teenagers in your neighborhood.